A Stacker Crane is similar to a bridge crane, except the hoist is replaced with a telescoping mast which is suspended from the bridge trolley. The mast is equipped with a load handling device such as single or double forks or a grab. 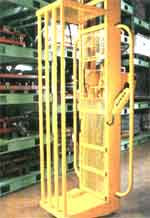 Stacker Cranes can be manually operated or powered and can span multiple aisles (such as in a warehouse, etc) for easy retrieval of stored components and/or parts. Click here to learn more about our Stacker Cranes, call us at 1-877-877-6778 or email us at sales@americancrane.com.